Anyone else feel like October was five days long and gone in a flash? Just me? I still managed to test out quite a few new products and decide on some new favorites despite feeling like we were just in September last week. I discovered a new foundation combination this month that's completely unlike what I usually go for. I start out with the IT Cosmetics Anti-Aging Armour Skin Perfecting Fluid* for a really smooth, non-silicone base that instantly evens out my skin tone. This stuff has to be shaken up A LOT more than I ever imagined necessary, but the instant results are definitely worth the arm work out. Then I've been putting the Urban Decay One and Done Hybrid Complexion Foundation* on top for a bit more of a satin finish. The two pair perfectly together and I could probably just mix the two before applying for an even faster result. The IT Cosmetics Miracle Water* is basically exactly like my all time favorite Body Shop Vitamin E Toner that I'm still having a hard time getting over the similarities. I never thought I'd be able to find a toner that would remotely stack up to the Body Shop one. I love this version because I'm able to see how much product I have left and it's a bit lighter on the skin. The new Body Shop packaging you're able to see product levels, but I'm still working through a massive stash of the old packaging. Other than that, the two are identical. I'm a happy camper. 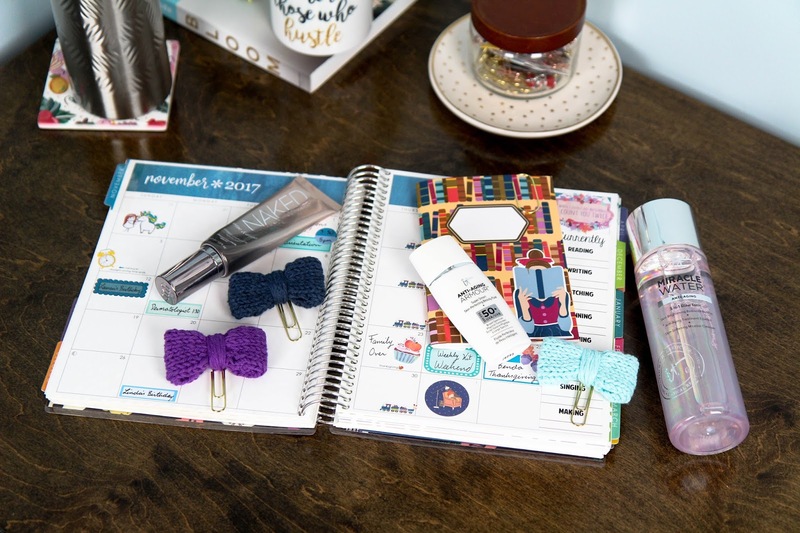 Although I'm sure you're tired of hearing about Lilac Pineapple Co by now, I had yet to include my favorite traveler's notebook accessory shop in a favorites post. The hand-knitted bow paperclips are as cute as they are sturdy and I think I have at least 12 of them now. They're like Pokemon; I have to collect them all. Plus use coupon code OHHELLO20 for 20% off! As far as traveler's notebooks go I've been still obsessed with the Oh, Hello Notebooks (now in B6). I've used up a few completely and I've turned one of them into a book tracker! I've been using these Book Review Stickers to help me remember the books I've read and my thoughts on them. Just in case anyone asks for any book recommendations, I'm ready. My new Ello Tumbler has to be my favorite purchase of the entire month. I can't believe just how cold it keeps my water even through an entire night sleeping. I drink a TON of water throughout the day and now it's always super cold. Definitely worth the purchase if you want an attractive water bottle and hate when your water gets warm. I also managed to vlog almost every day in October on my Vlog Channel. I think I missed only three days over a weekend and have had a serious blast filming our daily life. I'm keeping things going throughout the holidays so be sure to subscribe! I've also been loving Alex's Twitch Stream this month. He plays Overwatch and other games almost every night, but he lets me stream 90's computer games on Sundays! Now that Halloween has passed I'm feeling the itch for Christmas. I'm sure it'll be here before we know it so get to making those lists! What things did you love in October?